The city of Sochi is located on the Black Sea coast in a zone of subtropical climate. City has a total area of 3502 km² (within the city area of 250 km²). The population of Sochi is 424,280 people (2018). 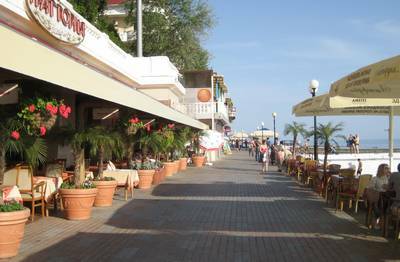 In terms of population, Sochi takes 2-nd place among cities along the Black Sea coast, after the city of Odessa only. During the holiday season, the city's population multiplied by coming to the city vacationers. The tourist attractiveness of this region has been significantly improved in the preparation for the Olympic Games. New hotels, sports facilities, ski centers and an airport were built. People come here not only to lie on the beach and swim in the sea now. Sports, entertainment and business events are held regularly. The warmest month of the year is August. The coldest months are January and February. Average monthly temperature in August in Sochi is 25-27°C. The average annual temperature of water in Sochi is 15,7°C. Most cold water is in February and March (8,6°C) and the warmest in August (24,1°C). In August, the water temperature can reach 29°C. The ski season in the village of Krasnaya Polyana usually begins in December and can last until April (this depends heavily on the weather). The swimming season in Sochi lasts usually from the third decade of May until mid-or late October. You can get to Sochi by car, train or plane. Geographic coordinates - longitude 43°35'07" latitude 39°43'13". Population - 429.1 thousand people. (2018). The average annual temperature - +14.2°C. Average temperature in January - +5.7°C. The average temperature in July - +23,3°C. Based on archaeological excavations, it is assumed that the first people penetrated into the vicinity of Sochi about 400 - 350 thousand years ago. Greek colonization of the Black Sea coast began at about VI-V centuries. BC. er. with the emergence of city states and lasted until about I at. BC. er. Around the end of the XVI century, the Black Sea coast falls into the sphere of geopolitical interests of the Ottoman Empire and Russia. As a result, the Russian-Turkish war of 1828-1829 to the Russian Empire formally leaves the modern district of Sochi. In fact, Russia was controlled only part of the coastal zone. The city of Sochi was founded in 1838 as Fort Alexander. In 1917, Sochi was awarded the status of the city. Pebble beaches are here. You will find better beaches at many resorts. The holiday season is pretty short here. Prices for services and goods here are not the lowest in the world. But will we recommend you to visit Sochi? Of course yes! If you have already been to other countries and other cities, then you definitely should come here as well. During the holiday you can visit other cities of the Black Sea coast. You can also make a trip to Crimea (by plane or by bus on a new bridge.) There is also an opportunity to visit Abkhazia. The location of these attractions and other interesting places you can see on the map of Sochi. You can buy tickets for flight to Sochi online. Oceanarium "Sochi Discovery World Aquarium" is the largest oceanarium in Russia. The total area of the oceanarium is about 6,000 square meters. Here are 30 tanks with a total volume of 5 million liters of water. In aquariums contains about 4 thousands of fish (more than 200 species of marine and freshwater fish). Address: Russia, Sochi, Adler district, Lenin Street 219a / 4. "Riviera" park is most popular park in the city of Sochi. The park is located in the central part of the city on the right bank of Sochi River, near the sea shore. The park has a large number of trees of different species, several ponds, cafes and entertainment facilities for the public. Address: Sochi, Egorova street, 1. Arboretum in Sochi collected flora of the Caucasus and many other countries. Its total area is more than 49 hectares. There are about 1,600 species of plants in the park. On the territory of the arboretum is also a 150 cubic meters saltwater aquarium. You can see the various inhabitants of the Black Sea in the aquarium. Address: Sochi, Kurortny Prospect , 74. Dolphinarium is located in Adler city. Dolphin pool has a diameter of 2 meters and a depth of 6 meters. Dolphinarium hosts performances of dolphins and other marine mammals. The aquarium - terrarium in Sochi presented more than 200 species of fish, birds, reptiles and amphibians (lizards, snakes, crocodiles). The total area is approximately 340 m2. Sea Port of Sochi has two passenger berths with a total length of 330 meters. Seaport can take passenger ships, ferries and cargo ships. Address: Sochi, street Voykova 1. Foreign tourists usually get to Sochi by plane. Direct flights to Sochi are performed from a small number of airports in Europe. Most likely you will have to buy tickets for the flight with an intermediate landing in Moscow, St. Petersburg or Riga. Find flights and buy tickets here. You can come to Sochi also by train from Moscow and St. Petersburg, but this way will take you a lot of time. Perhaps this route is suitable for those who do not like flying on an airplane. Tickets for Russian trains can also be bought online. The Sochi Airport is located in Adler town, about 25 kilometers southeast of the center of Sochi. The airport serves a huge number of tourists and ranks 5th in Russia in terms of passenger traffic. The distance from the airport to Moscow is approximately 1350 kilometers (flight time is about two hours). The distance from the airport to the ski centers in Krasnaya Polyana is about 40 kilometers. Tourists can get to the center of Sochi and to Krasnaya Polyana by rail and by bus from the airport. You can also get by bus to most of the settlements on the coast. You can book a transfer (taxi) from the airport to your hotel even before departure, online. The seaport of Sochi has 2 passenger berths with a total length of 330 meters. The seaport is able to receive passenger ships, ferries and cargo ships. During the tourist season in the passenger port offer trips by sea on ships of different sizes. Address: Sochi, Voikova street, 1. The railway station is located about 1.4 kilometers from the sea passenger station. Long-distance trains from many cities of Russia arrive at the station. From Sochi train station, you can also get to Tuapse, Adler, and also to the ski resorts near Krasnaya Polyana (Rosa Khutor station). There is also a bus station near the train station. Address: Gorkogo street 56, Sochi. The Black Sea coast is the most popular resort region in Russia. Therefore, there are many places to accommodate tourists. You can book a hotel room, a bed in a hostel or rent an apartment or a whole house. There are old health centers (sanatoriums) that were built during the Soviet times. These hotels continue to operate now. You can live in a hotel of any international hotel chain in any country. Maybe you should try something new now and settle in this old, Soviet hotel? Get acquainted with the architecture and culture of the USSR closer! You can find and book a hotel room with any hotel reservation service. We can recommend a few useful links to you. 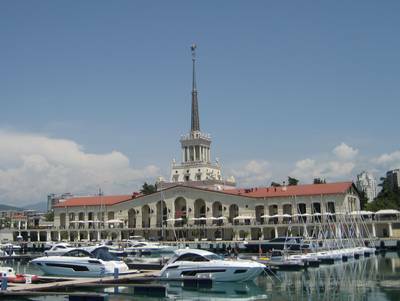 Get more information about hotels in Sochi and Adler. Sochi (together with the village of Krasnaya Polyana, located 39 kilometers from Sochi) held Winter Olympic Games in 2014. The ski resort of Krasnaya Polyana was opened in 2007 and will have to take sports outdoors (skiing, downhill skiing, bobsled, etc.). At the same time in Sochi will host indoor (hockey, figure skating, skating, etc.). A large number of hotels and political support - the main argument, which gave the city an advantage over other candidates. Sochi will become the first city with a subtropical climate, which will be held the Winter Olympic Games.